Another is working on an extension of the Digital Doodle app, where you can import a picture of your friend’s face, trace over it, and then remove the picture to reveal a Picasso-esque drawing. It’s like a drawing-helper app. Maybe we will see some similar things come out of Debbie’s art/technology classes over at McGlynn Middle School. Another team found an image from an amusing potato meme online, and used it to test out loading pictures into components. This evolved into an idea for a fitness app, where the user’s avatar begins as a “couch potato” and turns into a stalk of asparagus once they finish their workout. 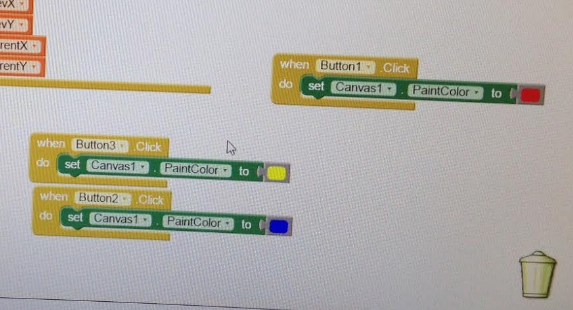 The user will click a button, which triggers a text-to-speech function that gives an instruction to start walking. 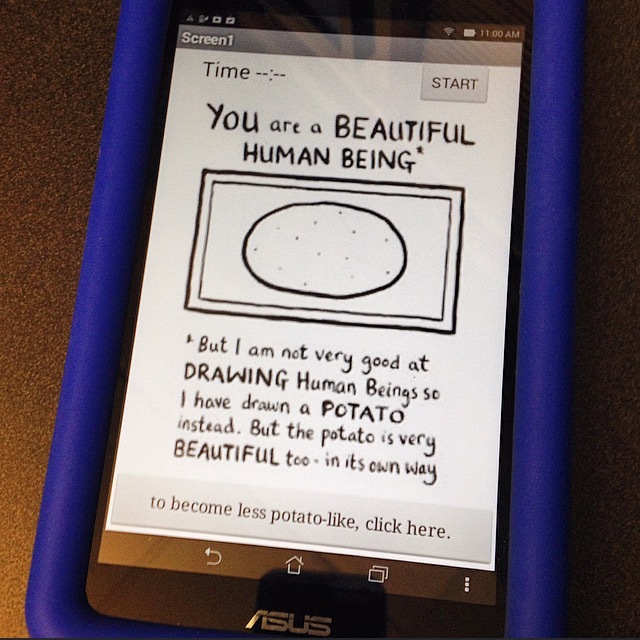 Then it sets a timer to count down the seconds, and ultimately change the potato image into an asparagus image. 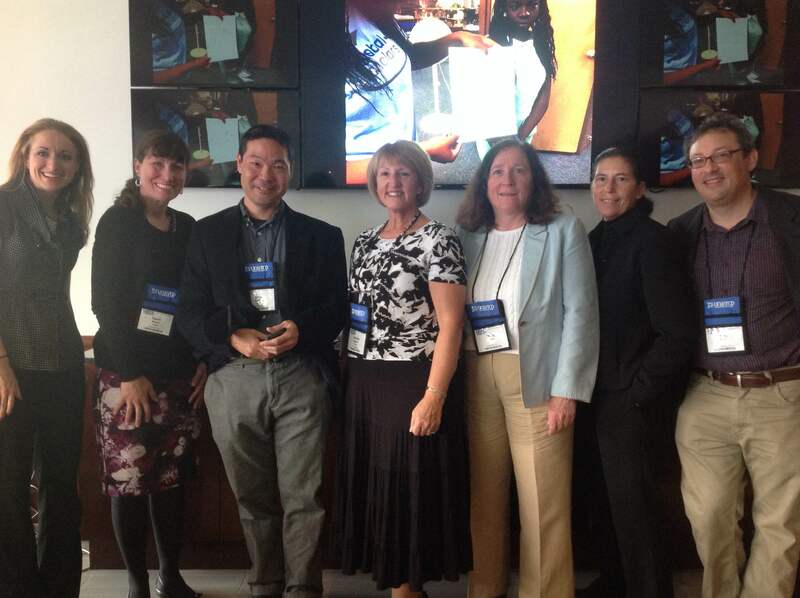 The MSP curriculum with Azita’s class has certainly flown by! 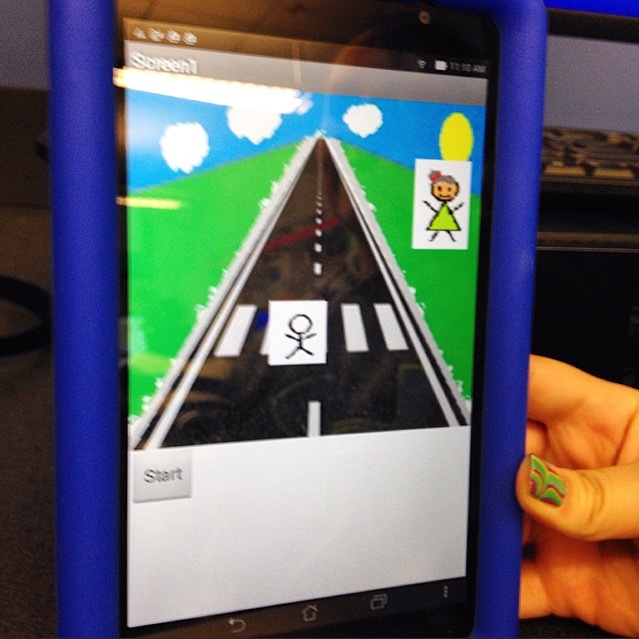 Other students are excited to incorporate the tablets’ GPS functionality into their apps. Stay tuned – more to come. Mike is about two-thirds finished with the curriculum for his two eighth grade classes at McGlynn Middle School in Medford. 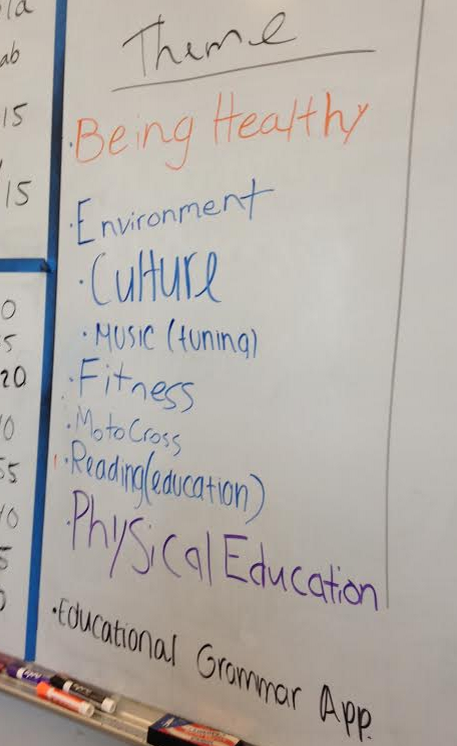 On today’s agenda, the students continued to develop their programming skills with tutorial apps, and also brainstormed ideas for developing their own, unique ones. 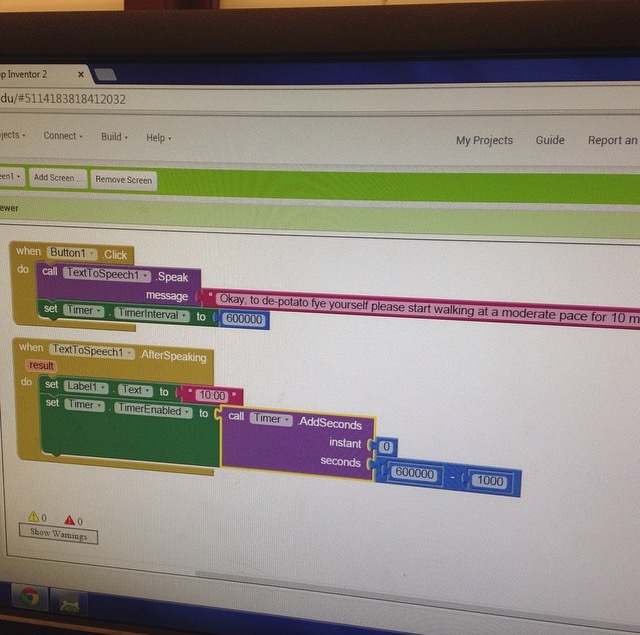 The students have been working on different tutorial apps at different paces. 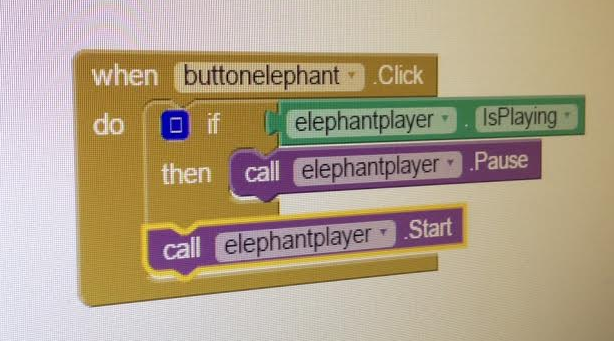 One pair worked on extending “Two Things,” an app that features a picture of an elephant and a picture of a monkey, plus buttons to play their corresponding animal noises. This app requires one sound to pause when another one starts playing – a slightly more complex feature than introductory text-to-speech apps, which play sounds all the way through. At first, the students struggled with the idea of nesting one logic statement within another in order to detect state – and how, exactly, these statements get ordered. We decided that sometimes, it helps to say the logic out loud in English before trying to fit the blocks together on the fly. 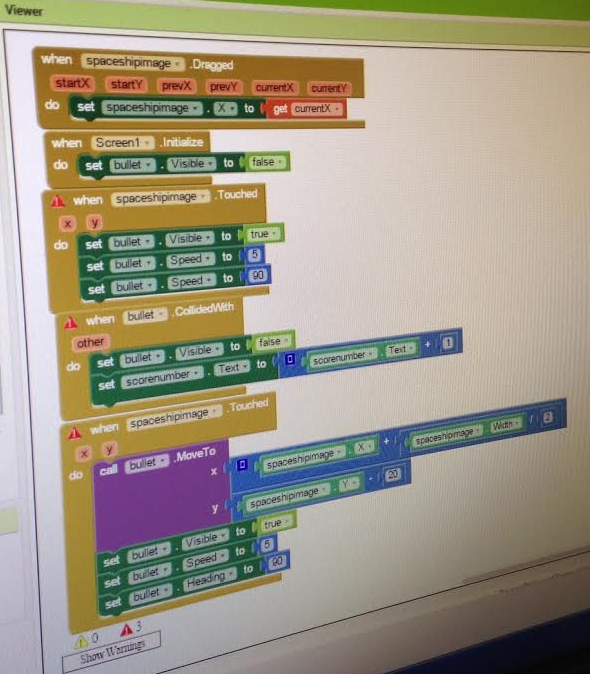 The students nearly had this code block working (changing the if-statement to an if-else statement)… when the bell rang! Excited to get things bouncing around the screen, they moved on to the Mini Golf tutorial. Another pair had similar excitement with the Space Invaders tutorial – but kept getting frustrated by red triangles, which indicate errors in the code. We talked about the importance of resolving bugs as you go, instead of letting them accumulate. 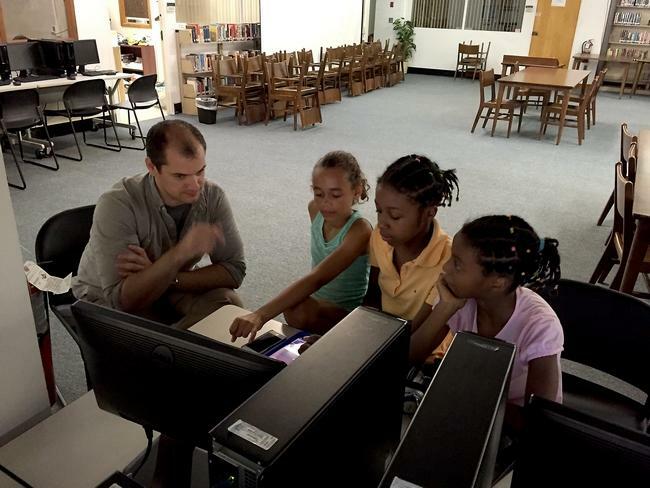 The other part of Mike’s lesson was to get the students thinking about the meaning behind their Martin Luther King app tutorial. What sorts of apps could they create that would be meaningful and helpful to their own communities? 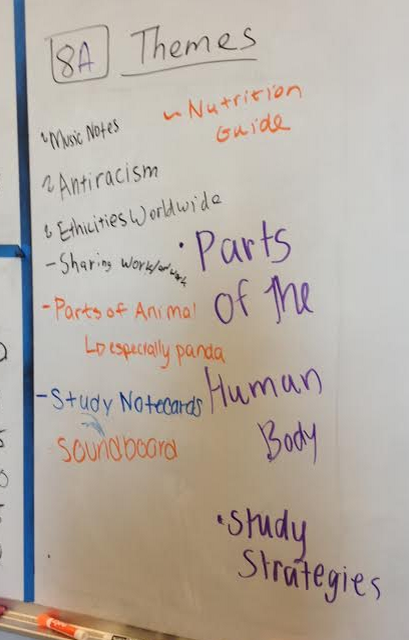 Students wrote their ideas on the board over the course of the classes. 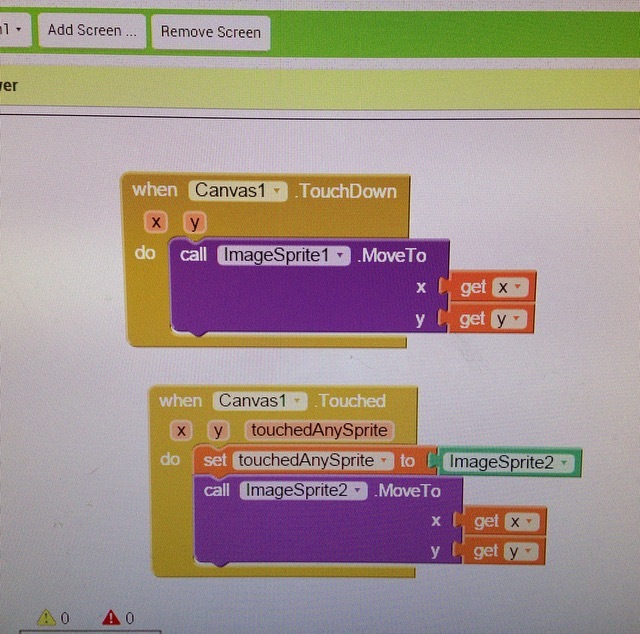 Next class, the students will vote on which ideas they like best, and will begin developing their own unique apps. 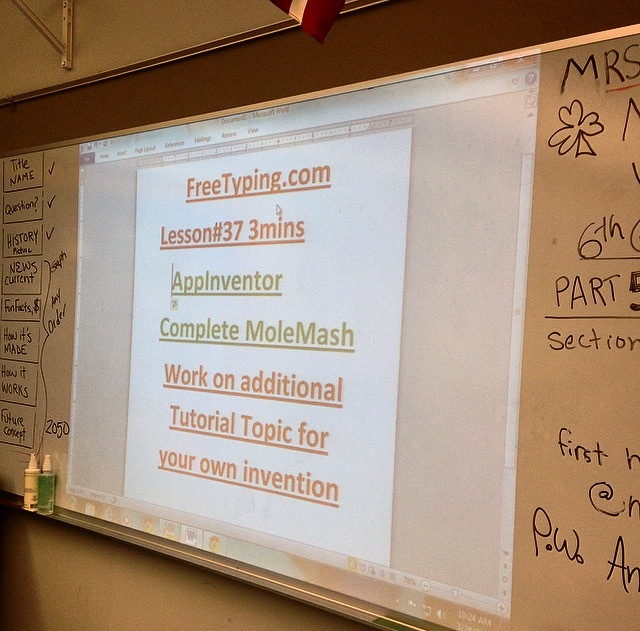 The MIT MoleMash tutorial for App Inventor introduces several best practices. But sometimes “best practices” distract novices from what they really need to understand. keeping a score variable, and incrementing it. Subprocedures. The code to move the mole around is put into a subprocedure. But it’s only two lines long. We don’t need a subprocedure for this. Positioning the mole by querying the canvas for its dimensions, constructing them as a ratio, and scaling it to the full canvas size by multiplying by the “random fraction” primitive. Seriously? I can barely understand this. Let’s just hard-code some X and Y limits. It’s easier to explain to kids this way. Concatenating label text with a numerical value. The approach for keeping score uses both a label to hold the word “Score” and a global for keeping track of the score number. Then, to update the score, the label “Score” plus the number value are concatenated. Let’s just put a number only in the text label. Then we don’t need a separate global, and we can increment the label’s text directly. Also there’s no need for an UpdateScore procedure. This is far, far simpler than the MIT code. Notice that the bounds of the random X and Y coordinates are 1 to 100. 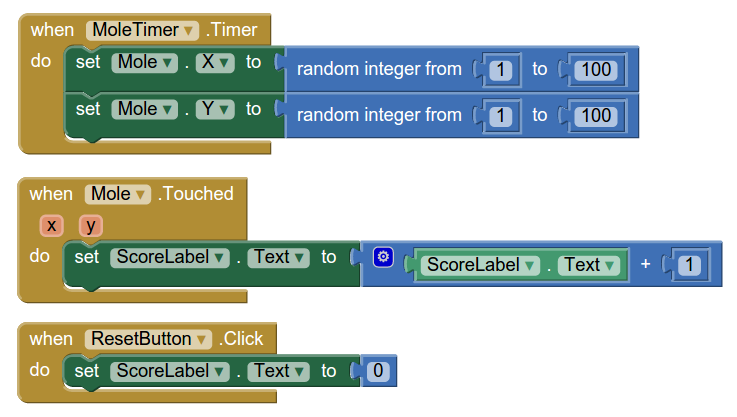 These are the default parameters of the “random integer” block when you pull it out of the palette. This means that the mole will only jump about in the upper left corner of the canvas. That’s fine! Kids can figure out on their own how to expand the range. For beginners, it’s better to use concrete values than abstract functions.